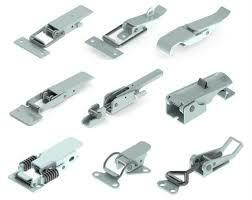 Welcome to Dirak, one of the tops Pull handle and toggle Latches suppliers company in India. In Dirak we offer a very wide variety of Pull handle and latches throughout the Indian market. Our products are made from high-quality material and under a supervision of top industry trained expertise. These pull handle and latches are durable which are popular among our customers for their best performance and long life. Lastly, these Pull handle and toggle Latches suppliers company in India are available at a reasonable price in the market. Dirak specifiers are range from different areas such as development, design, project & testing engineers to plant, works and process engineers, defence and civil service procurement, and industrial buyers who are spread over many types of industries in India. More than 600 variants are produced in both stainless and mild steel for various industry sectors. These are shown below. Dirak Pull handles and toggle Latches suppliers directly to OEMs and individuals throughout the pan India as well as all over the world. Dirak also supplies a range of complementary products from manufacturers including a large range of steel, silver plated and stainless steel toggle clamps, 3 Point Locking supplier, hose clips, hose clamp accessories, hinges, continuous hinges, pull to open latches and other hardware.